Ken Wiley, a jazz historian and musician, has a radio show called "The Art of Jazz" that airs Sunday afternoons on my favorite station, KPLU-FM in Seattle (and online at Jazz24). He has a reocurring feature in which he chases down a musical element -- a melody, a set of chord changes, developments on a solo -- through a number of records. I've often wanted to do something similar with movies, and in researching my MSN Movies feature, "Wither While You Work" (Dave McCoy came up with that headline; I wish I had), a few ideas occured to me. This one starts with King Vidor's great 1928 "The Crowd." The camera climbs up the side of a skyscraper (a miniature) looks through a window and a dissolve takes us to an overhead shot of an enormous diagonal grid of desks, emphasizing the regimentation and depersonalization of working life in the big city. In one of the most famous homages in movies, Billy Wilder paid tribute to Vidor at the beginning of 1960's "The Apartment" with a tilt up the side of the building and a dissolve to the famous image of the sea of desks. Wilder shoots it straight on, from above desk level, but keeps both floor and ceiling in view, the receding lines of desks and fluorescent light fixtures converging into infinity. The scale is so immense, it's funny. Later, when 5:20 p.m. arrives and the bell rings, everybody gets up, places covers over their adding machines, puts on their coats and goes home... and another dissolve shows us C.C. Baxter (Jack Lemmon) all alone in this vast office space, knowing there's no point in heading back to his apartment just yet. 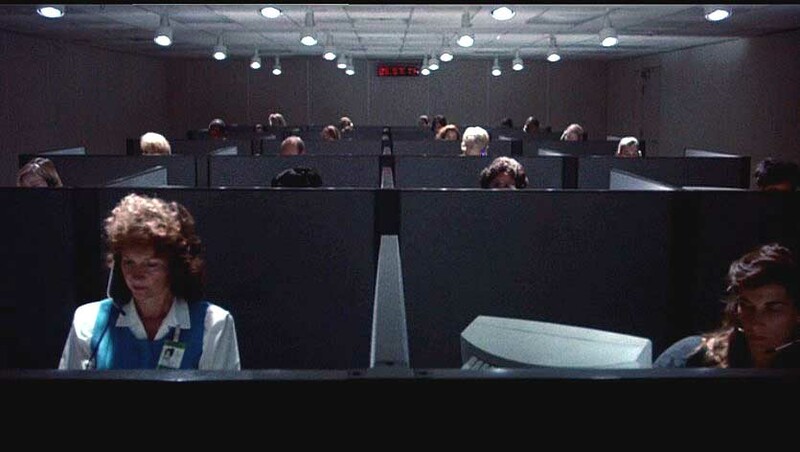 Michael Tolkin's "The Rapture" opens with a maze of modern cubicles at a directory assistance facility. (And, yes, this is soon to be an Opening Shots entry.) Tolkin actually moves into the maze, rather than simply surveying it from above. 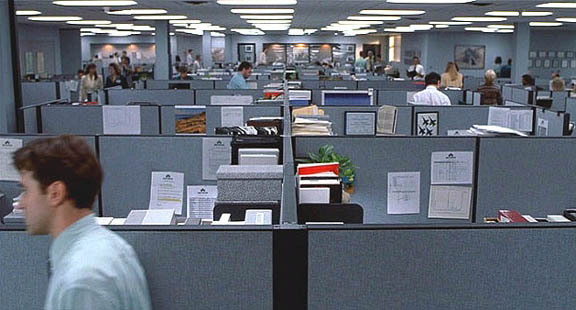 The camera begins by rising above a cubicle wall in the foreground, then moves across to the left, down one of the paths, then back to the right until it floats over another cubicle wall and comes to rest nearly on top of Mimi Rogers' monitor. (You may be able to spot her if you enlarge the accompanying image here -- she's in the fourth box back, just right of center.) Notice how Tolkin also uses the overhead lighting to add forced perspective, a sense that the room extends even further than it actually does. And the lighting is so muted that the shot almost seems to be in black and white. In "Fight Club," Edward Norton's anonymous narrator stands in front of a copier and describes experiencing the world through his depression as being like seeing "a copy of a copy of a copy." He's placed his Starbuck's coffee on the copier in front of him, and it rides back and forth on the top. When we look out at the office from his POV (fixed perspective), his copier lid moves back and forth in the foreground. Three people, also standing in front of copiers at perpendicular angles to the camera, are drinking their Starbuck's simultaneously, moving every bit as mechanically as the office machines. A man pushing a cart comes in from the left and moves in perfect sychronization with the foreground copier motion. The whole world has become a grid, populated by monochromatic automatons. That's the same feeling conveyed by the relatively short, stationary shot in Mike Judge's "Office Space," where Peter (Ron Livingston) comes to work and passes across the screen in the foreground from right to left (not unlike the copier lid in "Fight Club"). This one, especially, reminds me of newspaper newsrooms I've worked in. Again, the lines of the cubicles and the fluorescent ceiling lighting converge in the distance. Whenever I see this image now, I'm reminded of dominoes -- how one thing leads to another and Peter and his friends from the office eventually knock down these walls, literally and figuratively. This is just one of several instances of Tyler Durden slipping into The Narrator's consciousness, before he's actually met Tyler (yet another example of how "Fight Club" forthrightly tells you just how to watch it.) Tyler pops in for just a frame or two -- just like the frames of pornographaphy he enjoys splicing into kiddie films at his job as a movie theater projectionist.